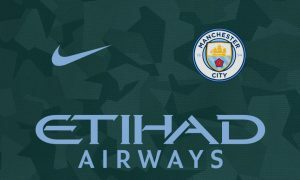 All the way back in May, there were leaks of Manchester City’s third team shirt for the 2017-18 season. Since then, there has been little else with the official release apparently scheduled for this month. The shirt is described as an ‘interesting new color combination, combining dark green with the club’s traditional sky blue’. The new third shirt is based on a global template by Nike with a camouflage all-over print. Additional template elements include a tonal stripe along each side and a sky blue stripe on each sleeve.jersey.